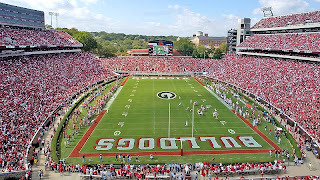 As you probably saw earlier today, ESPN announced that the Georgia Bulldogs will kickoff against the Alabama Crimson Tide at 7:45 pm EST on Sept. 27th. Georgia's all-time record on ESPN is 25-23-1. Completely unrelated, but did you catch Gary Danielson's comment at the end of the SC game? The Gamecocks have never won a regular season game on CBS. Damn. Do you have any "extra" tailgate plans for next week? I thought I had read in the AJC that SC hadn't lost since 1985 on CBS. If I remember correct it didn't say ever, but maybe I read that totally wrong. Either way that is a bad streak. And speaking of 1985, that was apparently the last time a team has started 3 - 0 and dropped like we have each week from the top spot. That was an Oklahoma team. I guess I am still having trouble understanding why a team like Auburn who won 3-2 against Miss St. (the seemingly weakest team in conf. this year), didn't drop or how a team like Clemson got back in the polls and we drop. I know we didn't crush SC by any means, but I do remember So. Cal losing to Stanford last year after being a 41 pt. fave. Anyway, I digress...I just hope we crush Arizona St. to cement the notion that that Pac Ten is one of the weakest conf. in all of D-1. anyone think espn gameday's a lock for UA? My guess is that it may not be a lock, but i I would be shocked if it weren't at the top of the list of options. This has to be the blackout game! If it's a black out, it better be Gameday. And vice versa. Either way, it'll be a good game. Hopefully we won't have to win in overtime this time round though. Please, no blackout, redout, or anything like that!!! Fancy uniforms have fucked us up the last two years for some reason. Just stick to the usual ones and GO DAWGS!!!!!!!!!!! !